America’s proudest moment as a country came in 1967, when Carroll Shelby’s team of A. J. Foyt and Dan Gurney sent Ferrari’s team home crying into their spaghetti bowls at the 24 Hours of Le Mans. That day, the Ford GT40 was cemented as a racing legend and America looked cool as hell. 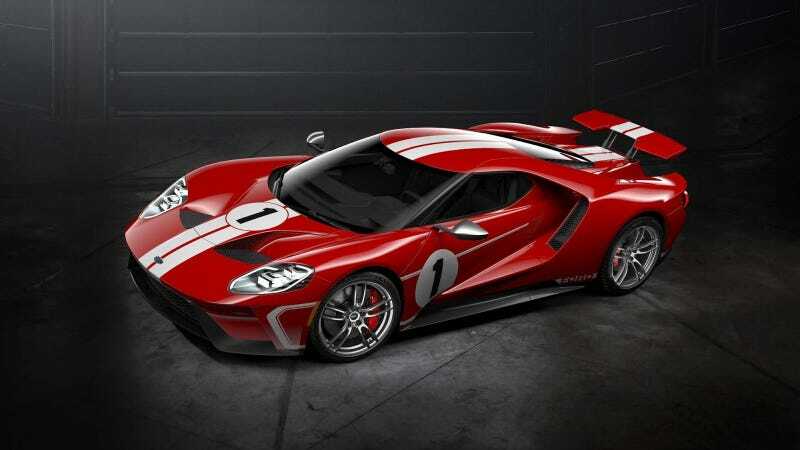 Now, to celebrate that kickass moment, Ford has dressed up its new Ford GT in some heritage colors. Ford unveiled the Ford GT ’67 Heritage Edition ahead of the Monterey Car Week festivities. In case you thought the regular Ford GT was dowdy and boring (it’s not), this one adds a glossy Race Red paint job, No. 1 hood and door graphics, 20-inch aluminum wheels red seat stitching (ooooh) and other tweaks. I don’t have anything else to say about this car except that it’s cool. Look at the pretty pictures of it.